With the new EGX-350 desktop engraver, you can easily expand your business by adding valuable personalized items to your product line. The EGX-350 quickly engraves a wide variety of materials right in your sign shop, engraving business or retail store. This highly versatile tool is remarkably easy to use and expertly engineered to produce sharp, precision text and graphics. The Roland EGX-360 boosts profits for gift engravers, trophy shops and jewelry retailers. The state-of-the-art desktop device produces everything from gifts, jewelry and awards to ADA signs and rhinestone decorated apparel. It virtually eliminates the need to outsource hundreds of jobs, delivering professional results with ultra-fast turnaround times. These versatile heavy-duty bench-top engravers enable you to produce a wide variety of applications including 3D reliefs for distinctive signs as well as name plates, awards and trophies, medallions, ADA signage, control panels and much more. A powerful suite of software is included. Roland EGX Pro engravers have the power, size and speed professional engravers need. In addition to personalized awards, corporate crests and promotional items, these benchtop devices are part of a complete solution for producing quality indoor and ADA compliant signage. Your signs will have an upscale look while meeting all ADA regulations. The Roland MPX-70 Photo Impact Printer personalizes charms, pendants and giftware with durable photographic impressions up to 529 dpi. The desktop device uses an advanced carbide-tipped stylus to strike metal surfaces with high speed and precision. It removes no material and operates quietly, making it ideal for jewellery stores, mall kiosks and photography studios. The MPX-80 is Roland's most advanced impact printer to date, with faster speed, higher resolution and the ability to imprint on curved surfaces. The MPX-80 gives jewelry stores, mall kiosks and photography studios the power of profitable personalization in a compact, easy-to-use device. In addition to flat items like pendants, dog tags, key chains and Zippo lighters, the MPX-80 takes personalization even further by customizing curved objects like pens, cuff links and money clips. Easy to use and compatible with popular 3D CAD software programs, the MDX-15 and MDX-20 are affordable, all-in-one scanning and milling devices perfect for a variety of product design tasks, from model and jewellery making molds, rapid prototyping, small lot production and package design. 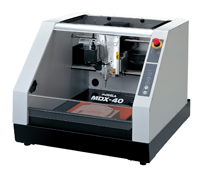 The MDX-40R allows product designers to keep their ideas secure while eliminating the added cost and turn-around time incurred by outsourcing. The MDX-40R comes complete with advanced, easy-to-use software. MODELA Player 4 CAM software accepts IGES, DXF and STL files exported from most popular industrial 3D CAD software programs. Virtual MODELA simulates finished shapes, estimates production time and determines suitable modelling depth to optimize time and materials. The new MODELA PRO II MDX-540 Benchtop Milling Machine, ideal for Subtractive Rapid Prototyping (SRP) and industrial design including the production of simple moulds and parts for in-house use. Well suited for short-run production applications, the MODELA PRO II can be purchased with an optional automatic tool changer, rotary axis unit and T-slot table which together support a wide range of milling applications. Every MODELA PRO II comes with robust, easy-to-use Roland SRP Player CAM software, and a convenient, easy-to-navigate operation panel. The JWX-10 is the jewellery-specific mill custom retailers have been dreaming about. Powered by a high-speed 20,000 rpm spindle, the 4-axis desktop machine quickly produces detailed wax models. It is the fastest and easiest way to create rings, bracelets and charms. A new 3D laser scanner designed to deliver all the precision of Roland's larger, more advanced LPX-600 in a compact, affordable device. Designed for ease of use, the LPX-60 can be controlled from a single button and comes complete with user-friendly scanning software that creates high-quality digital data from a wide variety of objects. 3D Scanning at the touch of a button. Roland DG's LPX-600 makes 3D laser scanning easier than ever. With the simplicity of operating similar 2D scanners, you can quickly and accuratly create digital data from an object for 3D CAD/CG applications. The LPX-1200 3D Laser Scanner quickly and accurately converts physical objects into 3D models. The LPX-1200 is a complete, user friendly system and comes with scanner and reverse modeling software included. Based on Roland's industry-leading vinyl cutting technology, STIKA is the ideal compact sign making solution for offices, schools, organizations, small businesses, shops and homes. With STIKA, even novices can quickly and easily create signs, labels, decals, retail displays, vehicle graphics and more right from a Windows or Macintosh computer. When used in combination with a standard desktop printer, STIKA contour cuts printed images for colourful, professional results. The CAMM-1 PRO is the Professional Vinyl Cutter series taking signmaking to new heights. Based on 18 years of CAMM-1 technology the new GX series incorporates several new features that make it easier than ever to create colourful vinyl graphics for signs, vehicles and many other applications. Includes Roland CutStudio, design software developed exclusively for Roland vinyl cutters. CutStudio is a full-featured software package that also performs as a plug-in for Adobe Illustrator and CorelDRAW. Other significant features include an automatic four-point registration system that enables precision contour cutting of digitally printed graphics for even greater visual impact. The GX-24 Servo delivers new levels of performance and versatility. In addition to cutting traditional vinyl graphics, it features a newly added optical sensor that allows it to contour cut flock heat transfers, labels, decals and other graphics printed with a commercially available printer. The GX-24 Servo features Roland CutStudio software, a full-featured design package that also functions as plug-in software for Adobe Illustrator and CorelDRAW. The #1 best-selling inkjet in the durable graphics industry is now better than ever. VersaCAMM VP is our fastest and most precise VersaCAMM to date and the worldâ€™s most versatile, reliable and easy-to-use printer/cutter. Featuring accelerated print speeds, an optional heavy-duty media take-up system, numerous hardware upgrades and powerful VersaWorks 2.2 RIP software, the VersaCAMM VP makes it easier than ever to print and contour cut 4-color CMYK signs, banners, billboards, POP displays, labels, decals, vehicle and floor graphics, heat transfers for apparel and more. The VersaCAMM VP is also backed by Rolandâ€™s five-year trouble-free warranty, the industryâ€™s longest bundled service and support contract. The SOLJET PRO III XC-540 is the ultimate high-volume production tool for stunning indoor and outdoor banners, signs, vehicles, decals, POP displays and more. Numerous upgrades make this the industryâ€™s most advanced printer/cutter including an impressive maximum print speed of 41 sq mt./hr. Engineered to support high-volume environments, the XC-540 delivers vibrant 6 color CMYKLcLm images, features a tri-heating system and advanced media feed and automatic take-up system, and can be upgraded with an optional dryer/blower. The XC-540 can also be configured as a 5-color model equipped with White ECO-SOL MAX ink, creating bold white graphics for packaging comps, window graphics, POP, labels, decals and more. The environmentally friendly VersaUV LEC-300 is the worldâ€™s first UV inkjet printer/cutter and uses safe, low-heat LED lamps. VersaUV prints CMYK + White + Clear on a wide range of substrates including foils, metallic and synthetic papers, BOPP, PE and PET film for unmatched color, texture and dimension. White ink creates crisp, flawless graphics and text and can be used as an undercoat to enhance the brightness of four-color prints. Clear coat beautifully finishes graphics with luxurious textures and special effects. Choose from hundreds of media options including flexible specialty substrates for outstanding results. VersaWorks RIP software is included for easy setup and operation. With a maximum print speed of 90m2/hr for the 104â€� AJ-1000 and 81m2/hr. for the 74â€� AJ-740, the AdvancedJET AJ series has redefined the standards for high-volume production printing. The AJ series is ideal for high-volume applications including banners, billboards, outdoor signage and other durable graphics, producing brilliant six-color CMYK+LcLm graphics on both coated and uncoated media. AJ graphics reflect superior ink bonding, and scratch and alcohol resistance for outstanding outdoor durability. An automated maintenance system ensures reliable performance and eliminates the need for daily manual cleanings. The AJ also features an optional Mesh Printing Unit supporting lightweight, unlined mesh media. The VersaArt RS series of eco-solvent wide-format printers integrates the latest technologies from Rolandâ€™s award-winning VersaCAMM and SOLJET PRO III models. Offered in 54" and 64" 4-color (CMYK) models, the VersaArt is the perfect production tool for both indoor and outdoor graphics including signs, POP/POS materials, banners, posters, vehicle graphics and wraps. It also supports soft signage and fabric applications. VersaArt prints reflect the highest image quality thanks to Roland Intelligent Pass Controlâ„¢ technology, a unique three-dimensional ink firing system that precisely controls droplet size and placement for exceptionally smooth results every time. Designed for productivity, the VersaArt prints at up to 136.7 sqft./hr. in standard print mode and 230 sqft./hr. in billboard mode on the 64" RS-640. Built to be energy efficient and low maintenance, the VersaArt is Energy Star certified and carries Rolandâ€™s new Eco-Label, an ISO 14021 Type II label certifying compliance with a companyâ€™s internal environmental standards. The SOLJET PRO III XJ series of wide-format inkjet printers is offered in 64" and 74â€� models, combining high-speed performance and superior image quality for the ultimate in six-color digital printing. Numerous upgrades make the XJ series the industryâ€™s most advanced wide-format printers and the ideal production tools for stunning outdoor banners, signs, vehicle graphics and more. In addition to a maximum print speed of 458 sqft./hr. for the 74" model, the XJ series offers print resolutions of up to 1440x1440 dpi for photorealistic CMYK+LcLm graphics. An integrated tri-heating system, optional dryer/blower unit and advanced media feed and automatic take-up system support the demands of high-volume shops. The Hi-Fi JET Pro II offers the best digital print quality in the industry. Thanks to variable droplet technology, 1440x1440 dpi resolution and precise media movement, this wide format inkjet printer is ideal for producing fine art reproductions, photography and color proofs. It can also crank out graphics with blazing production speed.